Gallia Academy junior Katie Carpenter returns a volley during the Blue Devils victory over Jackson on Thursday night in Centenary, Ohio. CENTENARY, Ohio — Court was in session for GAHS tennis on Thursday night … and the verdict was victory. 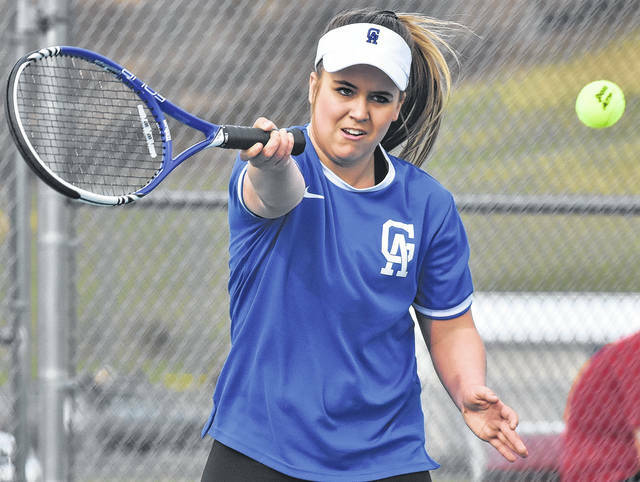 The Gallia Academy tennis team earned a sweep over visiting Jackson, taking all three of its singles matches and both doubles contest while picking up a 5-0 victory on Thursday night at Gallia Academy High School. In singles competition, Pierce Wilcoxon defeated Blake Wyatt 6-2, 6-1, Awane Sawamoto won 6-3, 6-3 over Mason Sheets, and Kirsten Hesson won 6-2, 6-2 against Raymond Armstrong. In doubles action, Katie Carpenter and Thomas Hamilton were victorious by scores of 6-0, 6-3 over Carson Strange and Garrett Turner, while Brittany Masters and Nick Mayes won 6-3, 6-2 against Trevor Waugh and Stephen Marshment. Following the game, GAHS head coach Randy Christian was pleased with his teams performance — particularly given the history between the two tennis programs. Gallia Academy returns to the court on Monday as it travels to face Washington Court House at 4:30 p.m.